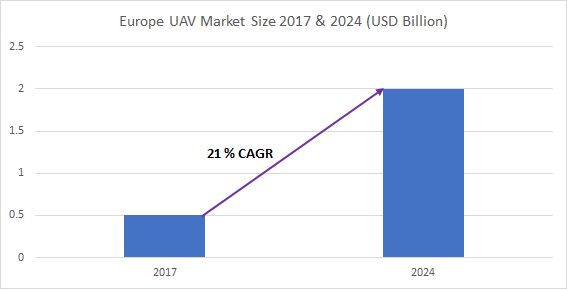 Europe Commercial Drone Market size in 2017 was estimated to be over 27 thousand units and is anticipated to grow at a CAGR of 24% with the market value of more than USD 500 million and is anticipated to grow at a CAGR of around 21% over the forecast timespan. The European commercial drone market is driven by the growing demand for drones for commercial applications. The drones are being widely adopted by private enterprises to acquire data from strategic vantage points that have been either too expensive or inaccessible. The relaxation by European Aviation Safety Administration (EASA) for the commercial use of drones also encourages the growth of the market. EASA has introduced a risk-based approach to offer performance-based guidelines for regulating the drones market. This will scale up the opportunities for market players. The venture capitalist and angel investors are investing in the unmanned aerial vehicle space, encouraging new players to explore opportunities in new applications. Rotary blade drone accounts for a stake of over 65% in Europe commercial drone market. The growth of the market is attributed to the superior features and benefits offered by rotary blade UAVs over its variants. Moreover, the advent of new applications in industries, such as logistics and transportation, fosters the UAV market. On the other hand, the hybrid drone market is predicted to attain a growth rate of over 25% during the forecast timeline. They are being widely used in commercial applications due to their ability to take off vertically and start-flight from any spot as a helicopter. The aerial photography market is the dominating application of drones in Europe with a share of over 35% revenue. The growth of the market is credited to the wide adoption of the UAVs for capturing high-quality images and videos. The real estate and advertising companies are also leveraging on the capacities of the drones to provide an immersive experience to the buyers for exploring properties. Germany is the most lucrative country for the commercial drone market due to the early adoption of UAVs for commercial purposes. The supportive government regulations in the country are among the primary factors that drive the demand. 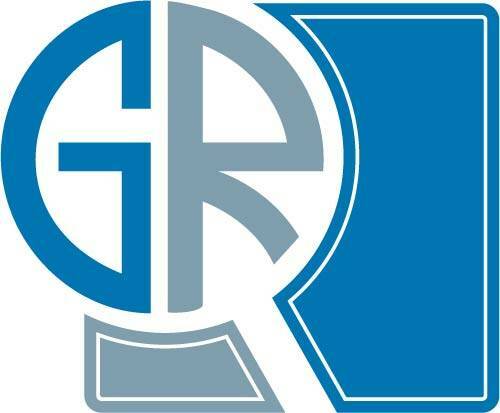 Germany is a country in Europe that has relaxed regulations on the use of UAVs for commercial applications. Furthermore, the country also recently revised the regulations, which highlighted the increasing matter of privacy with optimum utilization of advanced technologies. The European commercial drone market is characterized to be extremely competitive due to the presence of several multinational and regional players. Parrot, 3D Robotics, DJI, Yuneec International, Walkers Technologies, GoPro, Avular, Intel, BAE Systems, Cyberhawk Innovations, Delair-Tech, DJI, Flyability, Guangdong Cheerson Hobby Technology, Lilium, Pix4D, and Xiaomi are some of the major players in the market.